What is HTTP Strict Transport Security (HSTS) Preload List? The Customize Windows > Computer and Internet > Cloud Computing > What is HTTP Strict Transport Security (HSTS) Preload List? HTTP Strict Transport Security (HSTS)? HSTS Preload List? Are they appearing as new words? Not exactly, it is a thing which the major three browsers is trying to implement, there are related works since 2012. In this article, we have discussed the theoretical aspect of HTTP Strict Transport Security (HSTS) and will explain what is HSTS Preload List. In the upcoming articles, we will show you, how to properly configure your server for making it eligible to be included in the HSTS Preload List. What is HTTP Strict Transport Security (HSTS) and What is HSTS Preload List? Google Chrome maintains the HSTS preload list and other browsers including Firefox and Safari uses the same list. So, if we can pass the test, we actually getting included in the list for the three browsers. WordPress is the most commonly used CMS/Blogging software, Ubuntu probably is used most commonly for the cloud servers and Ngnix becoming most popular web server software. So, our guides will be oriented towards server side configuration for these setups. We need to know the theory first. The HSTS specification was published as RFC 6797 on November 19, 2012 after being approved on October 2, 2012 as a Proposed Standard. HSTS specification is based on original work of Jackson and Barth. When the HSTS policy is active for a website, compatible user agent automatically replaces all the unsafe by secure links before accessing the server. What is basically why the word Preload is appended. It will be invalid with a self-signed certificate. Actually it is for prevention of man-in-the-middle attack. Google Chrome and Chromium from 4.0.211.0 release. This Article Has Been Shared 2820 Times! Articles Related to What is HTTP Strict Transport Security (HSTS) Preload List? ApiOmat is typical Backend as a Service for Mobile and Web Apps. Mobile cloud backend as a service enable cross platform app development. Vyatta Network OS is Deb Based & works as software-based virtual router, virtual firewall & VPN. We have discussed to the fullest for Rackspace Cloud. Cloud Computing and Social Networks in Mobile Space Plays a Big Role in Lives in society, as Each Person Lives in a Large Network of Friends, All of Them Are Not Known. 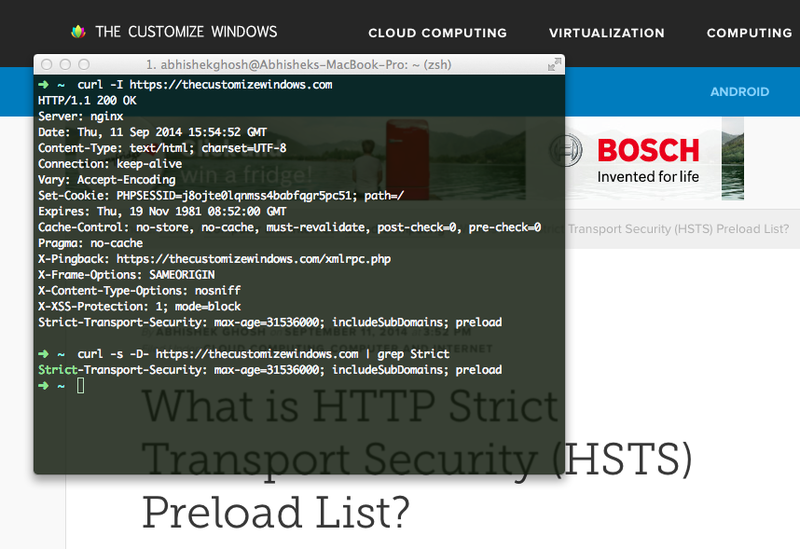 Title: What is HTTP Strict Transport Security (HSTS) Preload List? 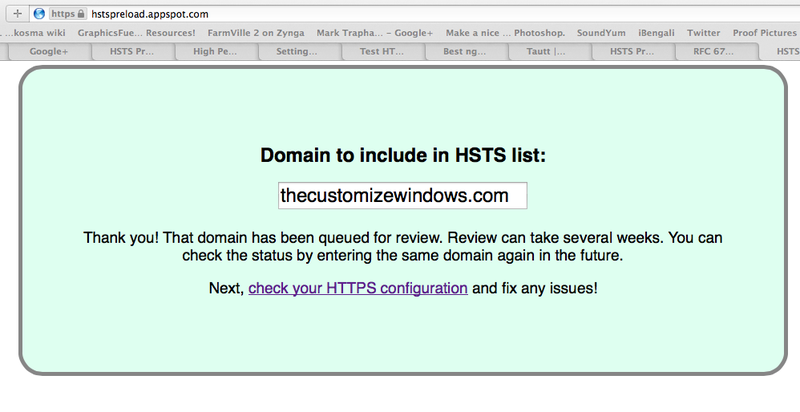 Cite this article as: Abhishek Ghosh, "What is HTTP Strict Transport Security (HSTS) Preload List?," in The Customize Windows, September 11, 2014, April 21, 2019, https://thecustomizewindows.com/2014/09/http-strict-transport-security-hsts/.